This blog has moved…come and see! A. Do you have the guts? B. Put your heart into it. C. Make up your heart. In modern times, the “heart” has been called, “the feeling mind”. That sounds pretty good to me. What do you think? A recent visitor responded to my post Is Chocolate Filling my God-shaped Hole? with the comment below (edited down). I think it would help to respond through a post, also. Now we can open up the whole thing to dialogue a bit more. Thanks for your contribution on this topic. I should have also pointed out [within that post] that the Hebrew equivalent of the emotions or passions (what many now consider the “heart”) were also referred to differently than the mind (i.e. set a different category, if you will–the bowels or “guts”). The “guts” implied connection with those qualities of emotion, and so forth. 1. What is translated as “heart” (in the KJV and others) is closer to what we now term as “the mind”. More specifically, the individual’s command center, or the place where decisions are made– which includes the will. 2. What we may think of as “the heart” that is, passions, desires, emotions, in the Hebrew language is connected with “the guts” or “bowels” of a person. For instance, “In his guts he loved her”. Yes, it sounds awkward, at best. Hey, everyone, please, weigh in. This post is open to opinions, thoughts, comments, or if you’re of the particular stripe…exegesis. Exegesis (EGGs -eh- Jesus) is this definition here. It’s not a variant, or French spelling of “Eggs and Cheeses” which we may be tempted to think at first blush, right? What you see here is a cup of “Turbo” and the Dark Chocolate Crepe (filled with mascapone cheese, fresh strawberries & dark chocolate truffle ganache. 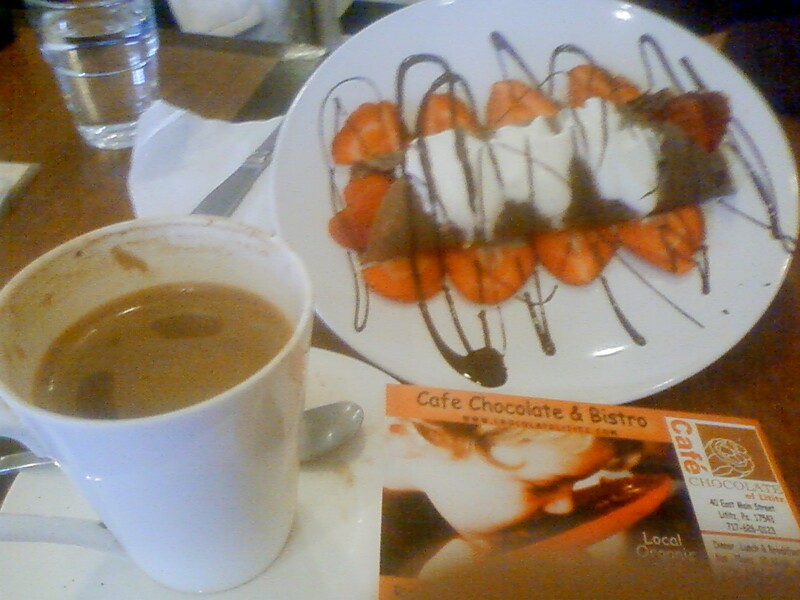 Served with more strawberries, fresh cream & chocolate drizzle) from Cafe Chocolate in Lititz. I only wish I had more than my poor quality camera phone to capture it. WHAT AN EXPERIENCE. If church were like this place, well, we’d all go a lot more, and be heavier. Heavier, but probably happier too. Jolly. We’d be jolly. Their signature beverage is the Turbo. Made with West African %60 chocolate cocoa, frothed with organic milk, and infused with a shot of smooth Espresso. Image a rich, creamy, chocolaty goodness that sort of shoots you into euphoria, on a Japanese magnet propelled train. Pleasurable? Yes. Think of your best worship experience with God…and then add fudge. Okay, don’t do that. I think I went over the line there, plus, it’s like comparing apples with oranges, or chocolate bars with communion wafers. It’s the kind of drink that can make you cry or sing (or in my case, both). Since God made chocolate, it was eventually a worship moment for me. And thank goodness for smelling salts! 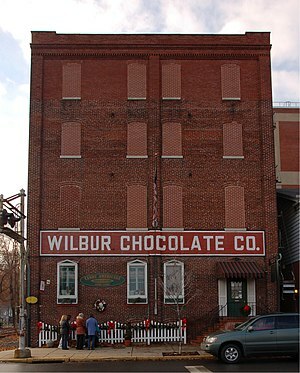 Lititz, Pa is also the home of Wilbur Chocolate, a very superior confectioner, and the now famous yearly Chocolate Walk. With Hershey Chocolate close by, this whole area of Lancaster County is sort of a Mecca for chocolate lovers. Also Sturgis pretzels is there in Lititz; and they boast America’s first commercial pretzel. You can make your own pretzel on their tour, and eat in fresh out of the oven. HAVE YOU BEEN TO LITITZ? What is your favorite chocolate goodie? Can Mustard Seed-sized Faith move a Mountain…of trash?